Dried or fresh fruits are often key additions to sweet and savory Moroccan tagines such as this one. Here, chicken is stewed until tender with onions, saffron, ginger, ​and pepper. The dish is then topped with apricots and a honey-cinnamon syrup. Fried almonds or sesame seeds are traditional, but optional, garnishes. The seasoning reflects a preference for fruit tagines that are zesty and a bit peppery. Reduce the white and black peppers (and Ras el Hanout, if using) if you want seasoning that is on the mild side. 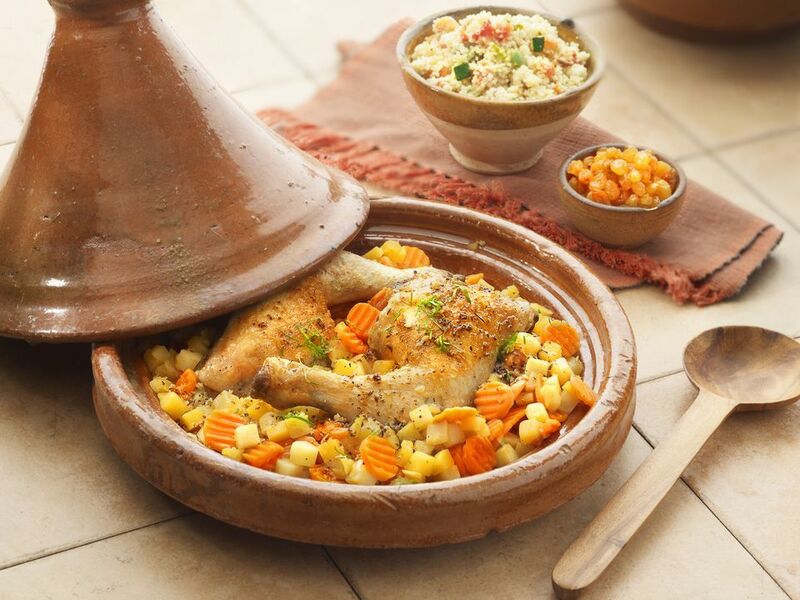 Cooking time is for traditional clay or ceramic tagine preparation. If you prepare this dish with conventional cookware, you can reduce this time by up to an hour. If desired, remove the skin from the chicken. Combine the spices in a large bowl, add the chicken, and toss to evenly coat the chicken pieces with the spices. Over medium-low heat, melt the butter in the base of a large tagine. (Use of a diffuser is necessary with electric or ceramic stovetops, and recommended for other types as well.) Add the olive oil, onions, garlic, and cinnamon stick. Add the seasoned chicken, meat-side down, in a single layer on top of the onions. Place the cilantro bouquet on top. Add the broth to the tagine. Swirl the water in the bowl to cleanse it of the spices, and then add the water to the tagine as well. Cover and leave the liquids to reach a simmer over medium-low heat. Once simmering, cook the chicken, undisturbed, for one hour. Remove and reserve 1/2 cup of the cooking liquids. Carefully turn the chicken pieces over so that they are meat-side-up. Cover and continue simmering for another 30 minutes to one hour, until the chicken is done and the liquids are thick and reduced. If you feel the liquids are excessive, it is quicker to reduce them in a small pot or skillet and then return them to the tagine. Mix together the honey and cinnamon to form a flavored syrup. Top your finished dish with the honey-cinnamon syrup, dried apricots, and fried almonds or sesame seeds, if using.